NORWALK — As rain fell from the heavens at Brien McMahon High School Saturday afternoon so did shots off the sticks of the Darien players. By the time the skies cleared at the half the top-ranked Blue Wave already held a 10-goal advantage, cruising to an 18-3 win over No. 2 Simsbury for their second straight Class L title and third straight state championship, putting an exclamation point at the end of a perfect 23-0 season. It was easy to see how Darien was able to accomplish that Saturday as Kevin Lindley scored 45 seconds into the contest and the Blue Wave never looked back. Lindley finished with three goals while Jack Kniffin and Riley Stewart also notched hat-tricks and Finlay Collins, Liam Rischmann and Colin Minicus added two apiece. “It’s bittersweet,” Kniffin, a senior, said after the game. “I came off the field and was tearing up a little bit. I gave coach a hug; I’m going to miss Kevin and Colin, my attack buddies, but we set the goal at the beginning of the year, the captains got together and said we’re going 23-0. 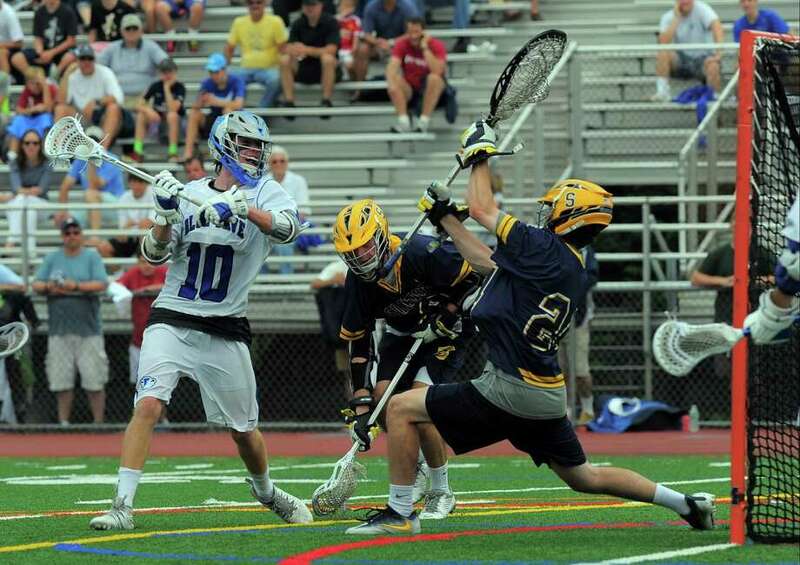 Simsbury came into the contest confident and with a chance to win its first state title, but was overwhelmed by the lacrosse machine that is Darien. “They might not realize that now but I’m sure they will,” Trojan coach Jim Martocchio said of how special a season they’ve had. Early in the year Darien’s only flaw was at the faceoff X, but under the tutelage of former Wave star and current Boston University player Andrew Pugliese, sophomore Tanner Strub turned in his best performance on the biggest stage. All Darien has done the past three years is make statements, after also going undefeated and winning Class M in 2014 the Blue Wave jumped to Class L last year and have taken that title in both chances. Scoring: D—Kevin Lindley 3 goals, Finlay Collins 2g, Liam Rischmann 2g, Colin Minicus 2g 2 assists, Jack Kniffin 3g 1a, Riley Stewart 3g 1a, Hudson Hamill 1g 3a, Jake Kirby 1g, Nick Green 1g; S—Keith Penny 1g, Torben Wunderle 1g, Willem Rooney 1g. Goalies: D—Ryan Cornell (5 saves), Andrew Clarke (1); S—Colin Walsh (7). Shots: D—30; S—10.